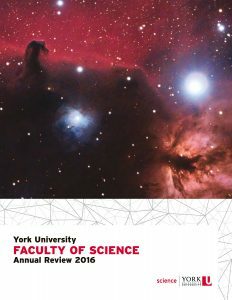 The Faculty’s 2016 Annual Review is now published. 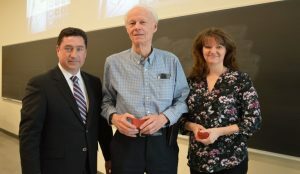 A luncheon was held for the inaugural Carswell Scholars, a graduate scholarship program funded by Professor Emeritus Allan Carswell, who attended the event with his daughter, Diane Carswell. Congratulations to the Carswell Scholars in the Faculty of Science: Matthew Burns (supervised by Professor Dan McArthur, LA&PS), Angie Raad (supervised by Jane Heffernan, Mathematics & Statistics), Richard Thai (Supervised by Cody Storry, Physics & Astronomy), John Campbell (Supervised by Michael Zabrocki and Ada Chan, Mathematics & Statistics), Kerene Brown (supervised by Derek Wilson, Chemistry), and Amanda Liczner (supervised by Sheila Colla, FES). The Faculty of Science granted 19 Dean’s Undergraduate Research Awards for this summer, tripling the number of awards given last year. 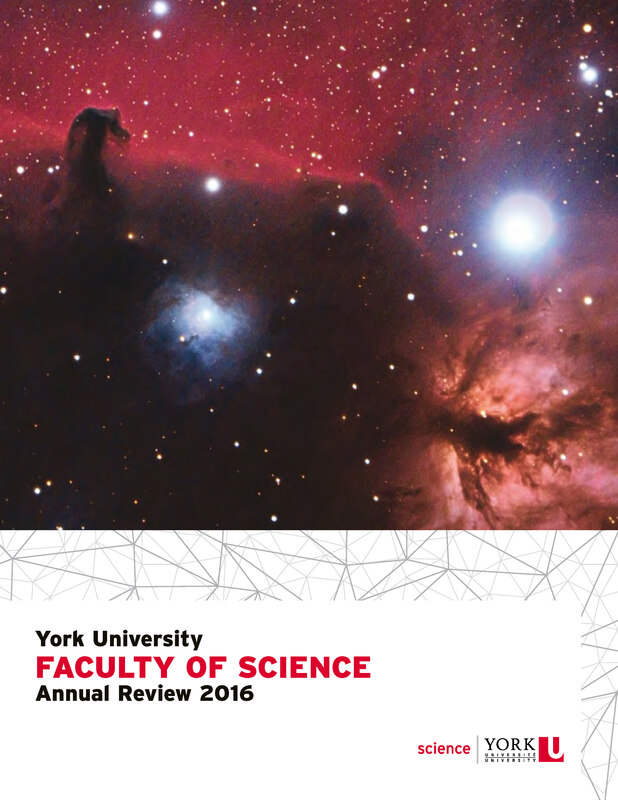 Eric Hessels (Physics & Astronomy) and Sapna Sharma (Biology) received York Research Chairs in Atomic Physics (Tier I) and in Global Change Biology (Tier II), respectively. Amro Zayed (Biology) received the President’s Emerging Research Leadership Award. This is the third consecutive year that a Science faculty member has won one of the two President’s research awards. Dawn Bazely (Biology) received a President’s Sustainability Council Leadership Award. Gary Sweeney (Biology) received a Mid-Career Investigator Award from the Heart and Stroke Foundation of Canada to explore the mechanisms of heart failure. The following graduate students received the 2017 Vernon Stong Scholarships: Adam Azoulay (supervised by Wendy Taylor, Physics and Astronomy), Nikita Ivanov (supervised by Sergey Krylov, Chemistry), Michael Laurentius (supervised by Edward Jones-Imhotep, LA&PS), Lidiya Misyura (supervised by Andrew Donini, Biology), Jasmeer Singer Sangha (supervised by John Moores, Lassonde) and Gil Yerushalmi (supervised by Andrew Donini, Biology). PhD student Cindy (HyeKyoung) Sung (supervised by Gary Sweeney, Biology) received the CIHR Institute of Circulatory and Respiratory Health Travel Award to attend the BioIron meeting in USA. Undergraduate student Olga Andriyevska (Physics & Astronomy) was selected for the Robert Tiffin Student Leadership Award. Olga is graduating this term and will continue as an MSc student in the Department of Physics & Astronomy. Sapna Sharma’s (Biology) research on ice cover and climate change was featured in the Brainstorm issue of YFile. A video was also produced. Some of the field courses offered by the Department of Biology were featured in the Innovatus issue of YFile. Dawn Bazely (Biology) presented “Arctic plants and people” and “Hardy survivors: tundra vegetation and the diverse habits in Canada’s polar regions” at a speaker series on the Canadian Arctic hosted by the Northumberland Learning Connection. She also presented “Inch by inch, row by row, here’s some botanical information to help your garden grow” as part of the Royal Canadian Institute for Science Talks. Dawn Bazely (Biology) co-organized the Forests Ontario Toronto Envirothon Workshop at York University, which engaged 55 high school students and teachers. Graduate students in the Department of Science & Technology Studies co-hosted the annual Binocular Conference with students from the University of Toronto. The conference featured a keynote by Jennifer Light, a historian of science and technology at MIT. The students also hosted a student workshop and networking event called NESTS, which was held in Toronto for the first time. Bridget Stutchbury (Biology) was profiled in the Ottawa Citizen about the new technologies she and other scientists are using to better track bird migration. Dean Ray Jayawardhana authored an op-ed in The Wall Street Journal about how astronomers have more to learn from planetary systems that are starkly different from our own. Paul Delaney (Physics & Astronomy) spoke to Newstalk 1010 about an asteroid’s close flyby, and to the Toronto Star about thermal vents on Saturn’s moon Enceladus and the possibility of life.